As many of you know, I've always had 'troublesome' skin; some days its combination and I have a T-zone oilier than Danny Zuko's 'do, then the next it's so dry its flaking off at my chin and nose - totally bipolar! Since curing my acne with anti-biotics in 2011, I no longer get more than, say, 3 pimples at once! I dont have any milia and those painful blind pimples are a thing of the past! I'm no longer at war with my skin, but I still get breakouts on the regular, mostly around my period. I know a lot of women have the same sort of skin troubles as myself so today I am going to share with you my top 3 never-fail anti-acne treatments! This Product is AMAZING. 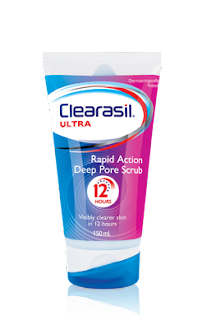 It promises 'visibly clearer skin in 12 hours' - and I attest to that! After using it just once, I noticed visibly reduced redness and size in the imperfections I was experiencing during 'that time of month', and after two days they were almost gone! I use this product every night in the shower after I've removed my makeup with a face wash. I love how the grains in the scrub are course enough to feel it working, I can't stand scrubs with pathetic, soft granules! 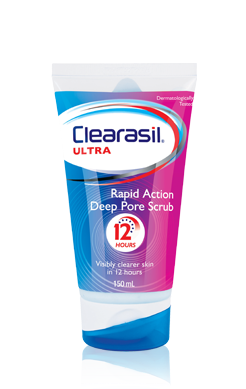 The active ingredient in the Deep Pore Scrub is 2% Salycilic Acid, a proven anti-pimple agent. It removes the oils from your skin and leaves it feeling fresh and clean, and my skin even stays quite oil-free throughout the day. I've also noticed a significant decrease in the number of blackheads I get on my nose and chin! I love this scrub so much I now buy two; one to keep in my shower and one to leave at my boyfriend Jack's house! This tub contains 65 white cotton-y pads, soaked in what smells like a POTENT anti-acne formula. 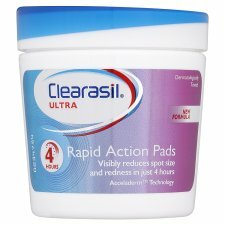 The Rapid Action Pads also contain 2% Salycilic Acid, but seems much stronger than the Scrub. This feels like microdermabrasion when you use the pads on your face, it feels as if every single dead skin and impurity is simply being wiped away! In fact, even after using my makeup remover and the Deep Pore Scrub in the shower, the pad still reveals a concerning amount of foundation and makeup that was left in my pores! This product feels quite harsh to the skin, and for that reason I would suggest you test it out on a small portion of skin before using it on your whole face. It makes my eyes sting if I get it too close to my eyes and my skin feels a bit raw after using it, but my face has NEVER felt so perfectly clean and polished! I don't think I could live without this product, it makes my skin feel brand new! My sister I have both use Benzac for years. You can buy this at any pharmacy, it is a cream formula where the active ingredient is Benzoyl Peroxide. which promises to kill up to 94% of germs and bacteria in just a few hours. Benzac AC is a cream formula that you apply thinly all over your face before bedtime; this stuff can be harsh - after all it does contains peroxide! 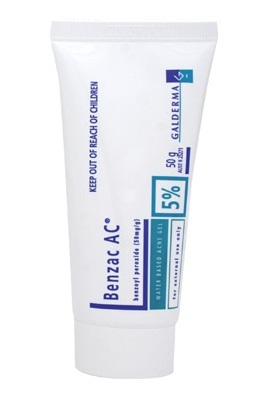 With the Benzac it's recommended that you start out with the 2.5% Benzoyl Peroxide cream, then work your way up to the 10%. If you don't, your face can react strangely by becoming red, swollen, and very itchy and irritated for a day or two. Another negative side effect is the dryness it causes, for me it removes the moisture from my skin so much it can become very dry and flakey. This can be addressed by using a moisturising gel every morning. Despite the side effects, there is no doubt that this product works every time for me when it comes to pimples. Well guys and gals, these were my TOP PICKS for anti-acne treatments - I hope they work for you just as well as they work for me! Have you heard or tried any of these products before? I use garnier pure 3in1 which has salicylic acid+mineral complex. I'm guessing it would be quite similar to the clearasil rapid action. I find that the garnier product does a good job cleaning my skin, it doesn't get rid of my pimples but I find that it stops my face from being so oily. I then use an alcohol free toner followed by the body shop tea tree anti blemish control moisturiser. I bought a product from the chemist that's called skinoren cream, it contains 1g Azelaic acid. It's an exfoliant cream that I apply at night time, I find it does an okay job. I'm thinking of going on anti-biotics again as I found that it helped get rid of most of my acne. I was on doxycycline for a few months last year. The one thing I'm finding the hardest is getting rid of scarring/hyper-pigmentation. Any suggestions on that? - Đúng vậy, chúng ta phải nghĩ biện pháp mới được. Vũ Văn Giác trưởng lão nói. - Hiện tại chúng ta không có ai có thể đối phó với cường giả thần bí kia, sợ rằng các lão tổ cũng không thể, trừ phi là Nhạc Thiên đại nhân tới. Tôn Quân trưởng lão thở dài nói. - Đúng thế, thần bí cường giả kia ngoại trừ Nhạc Thiên lão tổ thì không ai có thể đối kháng. Trần Xuân trưởng lão nói. - Chư vị, không ngờ mọi người ở đây. Đúng lúc mọi người đang ủ rũ thì hai thân ảnh xuất hiện, khi bọn họ phát hiện ra thì vui sướng không thôi. - Nhạc tộc trưởng, tộc trưởng tời thì thật tốt. Not sure how often you look at this... But why not post my question! Some advise would be lovely. Than you! Depending where you live you could get government insurance , but if you do have insurance already and are just saying you can't afford to go- a regular internal medicine or general doctor could prescribe medication for acne. You don't have to go to a specialist which usually cost more.. if your acne is extremely bad as to where it medically is affecting your life then your regular doctor can put in an approval for you to see a certain specialist that your insurance would approve of. But yeah it depends what country you live in, I'm not sure how your insurance system works.. if your allergic to benzoyal peroxide and not sylacic acid then you could use products with that at least.. but you've been struggling with acne for so long you really should go to your regular doctor and ask for a prescription.. my friend took acne medication for almost a year and his entire face has cleared up and the acne hasn't returned .. hope you're able to solve your acne if you haven't already! I read about your post on top 3 anti-acne treatments and saw that you said "I dont have any milia and those painful blind pimples are a thing of the past!" Did you have milia in the past and how did you get rid of them? Also, how long did it take for you to remove them? None of this Crap works all BS. Truth is that, your food has nothing to do with your acne and pimple. Acne can strike at any age irrespective of your food and living style. I'm 49 yrs old and I still get acne. I don't wear make up very much so my face is easy to keep clean. I do have health issues but I've never heard any of the side effects causing acne? When it comes to skin-care, I totally swear by the use of aloevera. And my favourite is Shower Gel with Soothing Aloe Vera & Maracuja as it contains aloevera and maracuja. Never combine acnecura.org routines. Certain ingredients do not mix well with others and you should never conduct a potentially harmful chemistry experiment on your face. Photographers, artists, framers, galleries, museums and dealers all need to ship art work. These how-to tips and product suggestions will save you time and money while helping you avoid common shipping mistakes. The five items being checked on here are Murad Acne Complex,accutane alternative Proactive Acne Solutions, Clinique Acne Solutions, Clear Skin Max and Exposed Skin Care. These products I have been using for four years. While I had a slightly oily T zone this wash dried it out amd required me to moisturise but nothing’s perfect and I don’t shine there anymore! It was a easy area to fix. Plus if I have pimples, two washes of this for two days and they were completely gone! Thanks Clearasil. Folks are desperately trying for your solutions that can cure their pimples and ways exactly to have rid of pimples. Some of these make it erroneous because they presume there are a few portions which can alleviate their own pains. They'd like the consequences fast.A answer demonstrated to aid in treating pimples and to get rid of them will be drinking a lot of water. Normal tap water is not just crucial for wellness, however it's also fantastic for healthier skin. It might not totally kill Zits, but It Might lead a whole lot in diminishing your pimples.Here you came to know that How to get rid of pimples? There are also various home remedies for pimples to get rid of pimples or acne instantly. Acne scars are the blemishes or the watery spots occurring on the skin and spoiling the smoothness of the skin. They get problematic owing to the delay in recovery. Some might prolong their stay on the skin forever. Though it is always advisable to see a doctor for acne treatment, one can even try some natural remedies for treating this acne problem. This natural treatment can certainly return the natural glow of the skin. Look on: skincaretour.com . I used to have serious problems with dry skin and acne (i have combination skin). honeslty since i have started using tea tree oil in the shower every morning, the difference has being unbelievable. my skin is so so good since i've started using it. Click here: skincaretour . Acne is a typical, actually, Kerry Washington Skin Cream overwhelming skin issue that influences all countries, races and sexes paying little respect to their ethnic foundations geological area or natural conditions. Very Interesting topic to read. An appropriate facial skin care treatment will diminish lines,Full Article wrinkles and hanging skin. Be that as it may, an extraordinary cream or salve will be powerful. The best way to clear acne is to drink water, moisturize your face, wash before bed and after waking up. Try apple cider vinegar and argan oil.